The above artwork adorns my dining room wall. Normally, I shy away from the use of scotch tape when decorating, but the pictures do a good job of disguising the jewel blue of the wall, which I have grown very weary of. 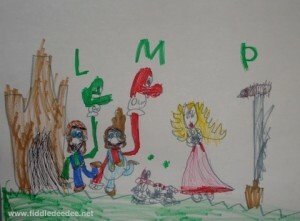 Jensen, who is still quite fixated on the Brothers Mario, is the artist. These are a few drawings that he whipped up today, all before breakfast. And it should be noted that Jensen’s interest in the inner workings of All Things Toilet related has re-surfaced. Just when I thought it was safe to leave him in the bathroom unattended. Unbeknownst to me, these two obsessions are quite related. A week or so ago, I was picking the girls up from a church event on a week day. Jensen noticed that the mens bathroom had been overtaken by workers who were entering and exiting with all manner of handy man paraphernalia. There were ladders, power tools, hoses, buckets, and electrical cords, scattered about at the entrance. Like a moth to a flame, he made a bee-line to the entrance of the restroom to investigate just what was going on. He stood a safe distance away, eyes shining, holding tightly to his Blues Clues Blanket, intently watching the enterings and exitings of the workers. At last one of the workers noticed him and said hi. Jensen, without removing his blanket from his nose, waved. I could tell by the crinkle of his eyes, that he was smiling big behind his Blues Clues Blanket. A worker stopped and told him that they were just wanting to do some maintenance on the bathroom while it wasn’t busy. Okay. Well. That’s an improvement over “dog”. 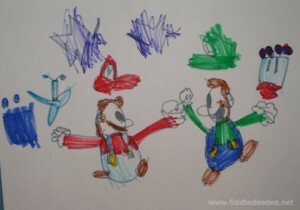 Then it all came together for me the other day when I was informed by Fiddledaddy that Mario and his brother, Luigi, were in fact, plumbers. How did I not know this? 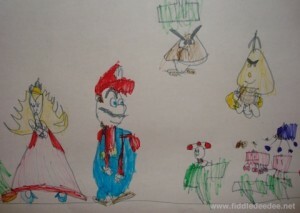 I’ve had personal dealings with Mario and his gang ever since the early 90’s, when I got my first Nintendo game. Secretly, I’m hoping that if this plumbing thing doesn’t work out for my young son, he might consider a career in illustrating. Because maybe I’m just his mom, but come on, for FIVE, he did all of these free-hand. And this artistic talent? He did not inherit it from me. Because this is a sample of my artwork at the same age. 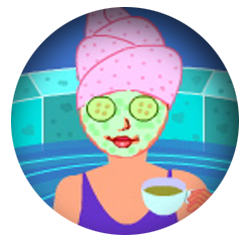 Fortunately, my only goal was to grow up and become Miss America. My 5 yr old son’s art is more inline with yours. Jensen is definitely showing talent. At least plumbers can make some serious income! Kiddo is obsessed with NASCAR racing and wants to be a race car mechanic. Again, at least he can afford a nice home for me! I would encourage the plumber line of work. They can make some serious money, and with the price of college tuition going up and up these days it is a pretty cheep way to make a decent income, since you don’t pay nearly as much to get trained in something like that. Hey! I teach first graders (a class I love so much I’m following them up to second grade when school starts in (gasp) a few weeks), and I’ll have to say that Jensen’s artistic talent is VERY advanced. I still have students who draw me with a triangle body and a circle head. No legs or arms. Makes me wonder why I bother to put on mascara most days. LOVED the pictures. He is talented! 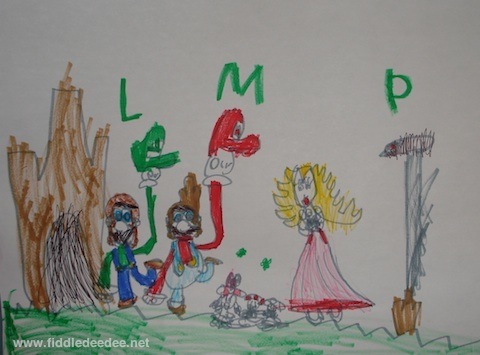 Lots of detail in his art that is way above his age level. Thanks for sharing, love the artwork. That is just amazing that he can draw like that. You automatically want to say, “yeah, right….no 5 year old can draw like that”….but I believe you! It truly is incredible, I am so impressed! Yep – he’s got the gift all right! And all the super-bright colors make ME personally very happy. God bless. Are you certain his middle name isn’t Picasso? I have a five year-old son who can hardly draw the sun. That is AMAZING. 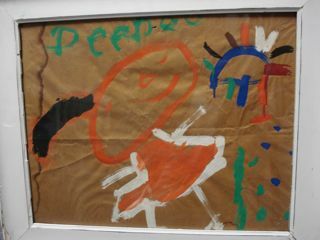 That is some fantastic art work coming from a 5 year old boy. I love it! Impressive skills!! Quite a talented boy. An illustrating dog? A plumber? Who knows what that boy will grow up to be! His illustrating is amazing. I could tell exactly who they were supposed to be, even without your description. I think his work is greaaatttt! If I had done at 5 what he does now, I’m sure I’d be famous by now! I teach 4 year old preschool. They’re 4 & 5. Let me just say, you have an artistic genius on your hands. 🙂 Be proud!! I’m impressed….